I'm surprised this thread hasn't gotten more responses, considering it is a very well written out piece of lit from the most widely-known boosted Camry guy on the continent.. Location: Baltimore & Washington D.C. Very great info, thank you Adam and Tony. Where did you get that intercooler? Price? etc. ^PaladinGreg06 (Silverlicious' original owner) had it done. SpeedySolara wrote: Where did you get that intercooler? Price? etc. PSE Chargers....around $2800. I believe. I don't know if that price was with the rebuild or not. I am on the same boat as most of you.. Recently, I got greedy and installed a 2.25" pulley so I can get 10-12 PSI right off the line. Long story short, I have a variable bypass setup so that the supercharger builds 12 PSI of boost at low RPM's but gradually tapers off and ends up supplying about 7 PSI of boost on the top-end. I noticed now with the warmer weather, my TRD SC heatsoaks... IAT's reach up to the 60's deg C, so I am trying to do some basic porting on the SC and modify/upgrade the venturi/S-tube, like ENDYN's method. Nice info! I will be looking for this in the future. Thanks Tony! There is an intercooled TRD Charger done years ago........it;s around the forum. Thanks for the info Tony. Too bad your in Canada. wow...this was a great read. fantastic info! im going to have to re install my CAI. 330 whp , 331 ft. lbs. 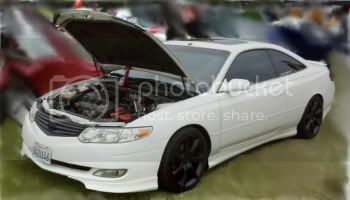 torque Camry , Track driven , Race proven , lots of mods.